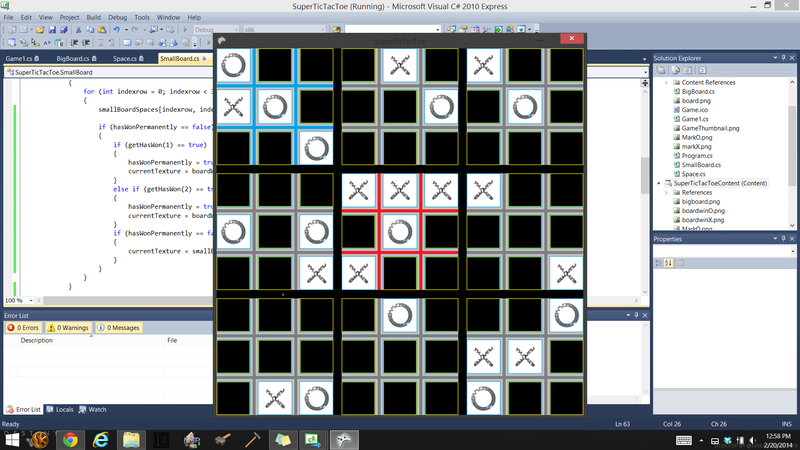 For this month competition I will be programming Super Tic-Tac-Toe..
For those of you (probably everybody, its not a very popular game) Read this. Super Tic Tac Toe is a variant of the classic game of tic tac toe that involves a lot more strategy and clever thinking. Super Tic Tac Toe is played on a 3 by 3 grid of 3 by 3 tic tac toe boards. A players move in a small tic tac toe board restricts the movements of the next player on the larger tic tac toe board. Winning a small tic tac toe board gives a player a point, on that spot. The goal of the game is to have the most points when all 9 small boards are won, or get 5 wins. I will attempt to update this regularly. 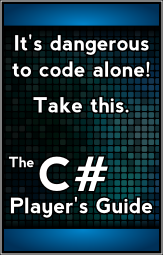 I will be attempting to write this in XNA which is something new(ish) to me. 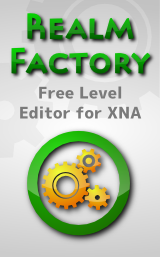 using Graphics and other cool features of XNA..
Level 1: Downloadable Playable 2 player game — 100% Complete!!!!!!!!!!! Level 2: Simple Menu, Rules Screen — 100% Complete!!!!!!!!!!! Level 3: Animated Sprites(just cuz), Players that have names, Names/Score appears during gameplay. — 00% complete. Level 4: Save/Load Games, Gui ingame. — GUI 90% Complete! Level 5: Some type of GUI that involves the computer playing itself in the backround behind the menu. — 00% Complete. So there are my goals, I really hope to get past Level 3. and I think I can do it, but the next two are really stretch goals that should/might be accomplished AFTER the one month period..
After finishing this challenge I really want to work on AI stuff.. maybe a tower defense game? Please Download and give me suggestions and feedback..
Rb can you Retitle the forum to "Super Tic-Tac-Toe (Swatacular)" I cannot seem to do it on my end. Yeah, sorry. I was wondering if that was going to be an issue. I'll also double check the forum permissions and see if I have control over that. It actually says for permissions that under the ability to "edit posts and thread meta", the box for "author" is checked. It seems like you should be able to do this, since you created the thread. It's not easy to find. There should be an option towards the top, but under the description box that says "More Options". Do you not have that? If not, I have some other options (none of which I'm all that thrilled about) because you guys should be able to edit posts and threads that you create. While Ive only done 4-10 hours of programming in 3 days.. I can still tell you what ive done.. I have gotten the large board to be drawn and all 9 small boards to be drawn with spaces inbetween.. Step after that, Basic Player Input. you can download the code above in the OP. If you look at this image.. you can see that I have gotten each of the nine boards to draw in correct positions, and all of the squares to draw in the correct positions.. next thing im working on is player input..
"Level 1: Downloadable Playable Two Player Game"
two more steps to go before Im ready for level 2..
1. Some random code to calculate who actually wins the game and a few brush ups in code. It's looking really good, Swat! 1. Go to Project > Publish. 2. Set the location to wherever you want your game to download to, like the desktop. 3. Choose CD Rom or DVD Rom. 4. Select whether or not you want it to check for updates (I don't know how this works, so I just said no). 7. Make an account on Bitbucket and create a repository (here's a tutorial!). 8. Go to downloads tab, enter the captcha, and upload the zipped file. 9. Provide a link to the downloads tab repository page. 10. You're done! Can't wait to see what you've got! EDIT: Make sure your repository is public, because otherwise we won't be able to follow the link! alright Rb… Just invite me.. or PM me whatever referral code you got and when I sign up tomorrow Ill use it. I need to invite you using your email address. Send me your email address that you want to use for BitBucket in a PM and I'll send you the invite right away! Alright.. I updated the Main Post! Please Open it up and check it out! Looking good, Swat! It looks like your game is working! I don't know if you were looking for this, but just a couple of thoughts. It would be really nice if the game somehow highlighted the area that the next player has to play in. I found myself getting it wrong on occasion, and I think there's a chance there might be a bug somewhere in it. Sometimes I was pretty sure I knew where I had just clicked, and what place I needed to click in next, but it wasn't working. I had to click elsewhere. I think having the game highlight the board(s) that can be played in would help make this easier to see. But it's looking really great! I think even at the point where it's at, even if you did nothing else with it, you have a credible claim to making a complete game in a month! (A lot less than a month, actually!) Nicely done! thanks! As far as your thoughts.. Im waiting on the Art directors :P (brothers) to write some transparent TicTacToe boards for exactly that.. So you can see where your next move is supposed to be… and then to see who is going next, i Hadnt thought of that.. but its really easy ill just make the last X or O highlighted so you can easily tell who goes next.. But yeah.. thanks for the complement. I planned 5 different levels.. so technically if I am supposed to finish All 5.. I am far behind :P.. but that isnt the point.. Illl be programming till the last day! I Just Got a new Update!!! Go Check it out (you may have to delete your old one first or something. Once again.. I now have the Rules screen and Main Menu!